The oceans are the lifeblood of our planet. They offer huge potential for human development. Ensuring their sound management and sustainable use is a vital part of our work to achieve the Sustainable Development Goals (SDGs). Clear rules and stable framework conditions are necessary for peaceful cooperation between countries, blue growth, and sound management. 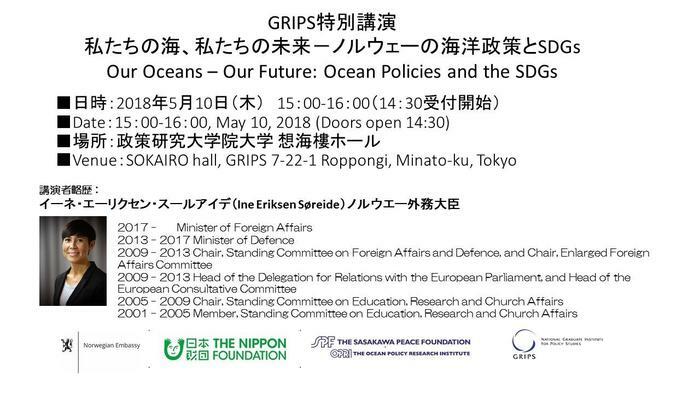 How can we ensure closer coordination between the various ocean initiatives and actors in the time ahead? Norway’s Foreign Minister Ine Eriksen Søreide will explore these issues. Join us for the discussion. Please register at this registration form by noon on May 9th. If you cannot open the form, please send email to GIST Secretariat, gist-ml@grips.ac.jp Registration email must include: 1) your name, 2) institution, 3) position, and 4) e-mail address.